Dear Zara, women come bigger than size 16, so deal with it please. And no you don’t really do size 18…try finding a style that comes in XL on the shop floor…..HARD. 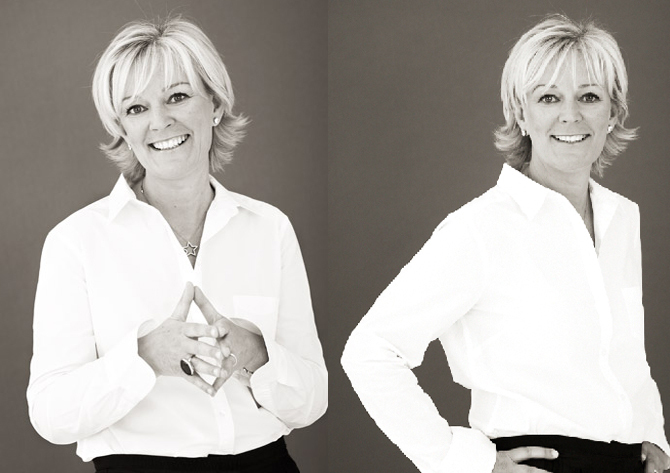 So that over with, the brand is doing some lovely, wearable clothes that work brilliantly for all ages, you may remember we recently featured Ana Rosado’s photo shoot with older model Jenni Rhodes looking gorgeous in the clothes. So on a trip to the newer Oxford Street store (opposite M&S) I found the following styles you might like to consider buying now if your wardrobe needs a shot of late summer style, together with a couple of starter-buys for autumn, if you can face thinking that far ahead. 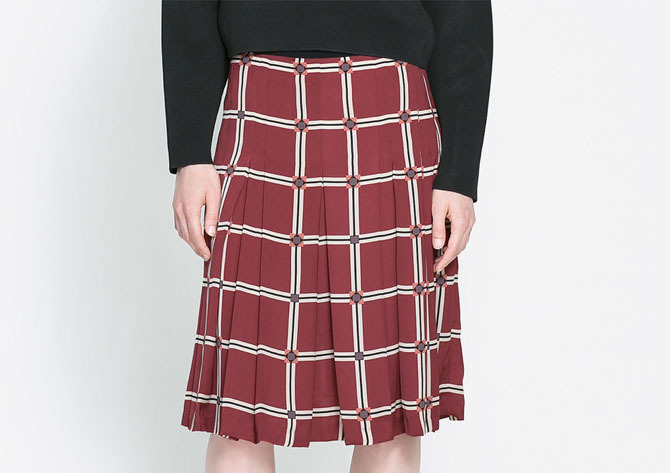 Secondly you might like this pretty printed, box pleated skirt in maroon (hot winter colour) with a neat black waistband in a great late summer weight. I love a skirt that has a gentle swoosh as you walk and the box pleats on this add a nice bit of tailored waist structure that keeps it all quite grown up. I thought it was silk when I first felt it but it’s just a good quality polyester. Team it with the denim jacket above for a bit of casual glam, try just buttoning buttons 2,3 and 4 up on the jacket with a T shirt underneath too. 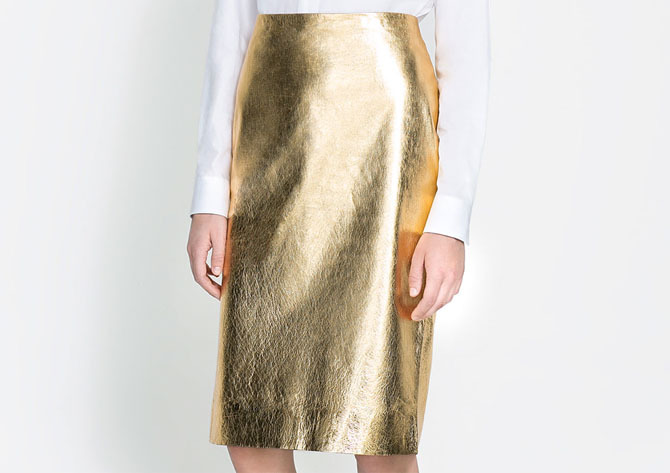 The Skirt is £59.99 here and again would easily move into autumn worn with a warm sweater. Then, if you are thinking about winter and of course shops and magazines force us, kicking and screaming, into buying stuff early -perhaps we should resist?- then check out this really fabulously shaped, kimono sweater in steely grey-blue. A word of warning, it’s cashmere, so if you have moth issues you might want to skip it and this image above disguises the lovely length the sweater really is, it’s bum-covering, tucking it in, as the stylist here has done, is a skinny/young person’s game. Gorgeous sleeves and a great neckline….it’s a bit pricey but it looks a keeper, £129.99 here, Ridiculously it only comes in medium, but it is big. Next articleAnkle socks for the over 40’s? The metallic leather is a little scary. 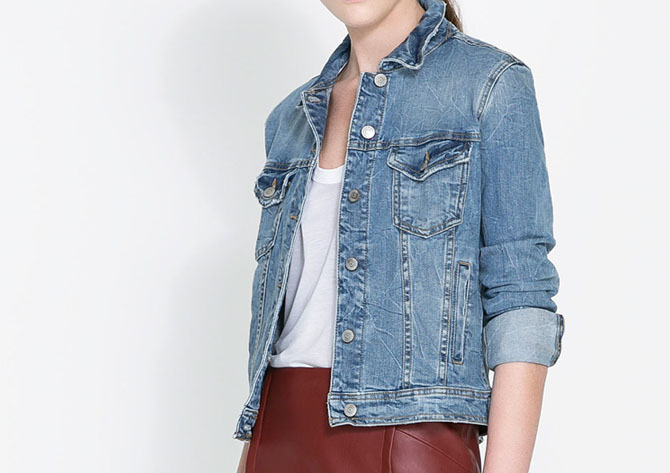 But I’m really liking the maroon leather skirt, featured with the denim jacket…!